A girl has two best friends – diamond and black flats. Black flats are considered a closet staple because of its versatility. It goes with absolutely anything inside your closet. Pair it with a cute cocktail dress, for dressing down on your off days or even to work. It’s certainly a must-have that many women should really invest in, especially if they’re more into flats than pumps. Since the style of black flats are mostly just simple, the trick is to pair it with an outfit that looks good. An outfit that will make you look stylish even in just basic pieces. Below are fashionable ways to style a pair of black flats. Nothing is chicer than an all-black outfit. You could wear it with the usual boots or high-heeled pumps, but for days that you want to wear a simple yet stylish outfit but would like to be comfortable, then a pair of black flats is a great choice. 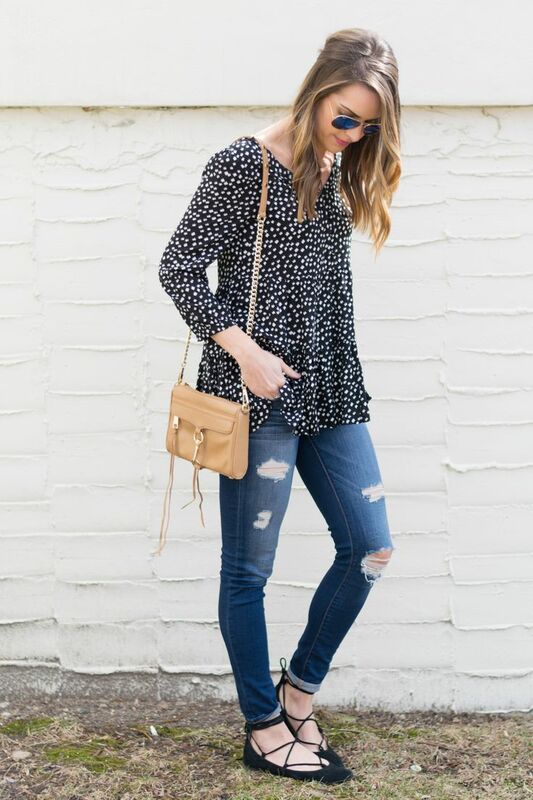 Wearing your black flats with the usual jeans and blouse is a great way of looking fashionable for the day. Make your outfit stand out by choosing a pair of ballerina lace-up flats to go with your cute blouse and distressed denim jeans. Running errands on weekends? Pair your favorite black flats with loose pants, knit top and a cute outerwear to keep yourself warm. Take inspiration from Danielle of We Wore What. She paired her pointed-toe black flats with a white top tucked in her cropped pants and a white longline cardigan. For days when you just can’t be bothered, days that you want to look trendy but doesn’t want to exert too much effort, wear your black flats with an oversized scarf. 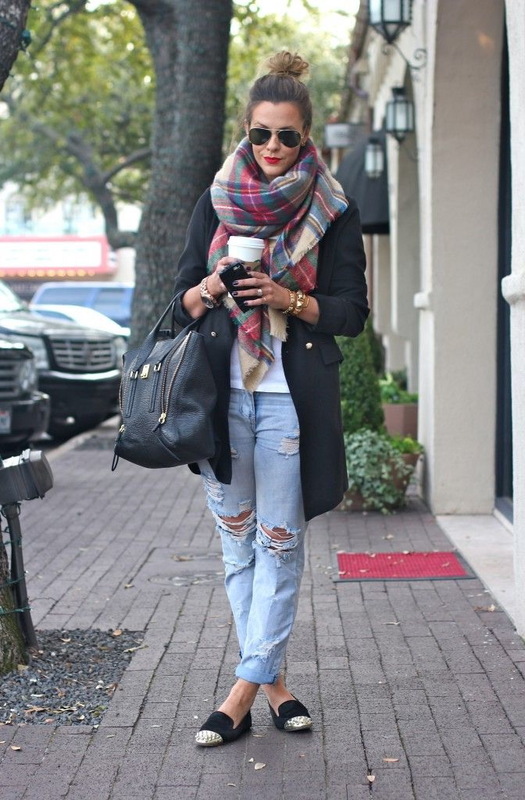 There are tons of ways to style your scarf. Black flats are great alternatives to heeled shoes especially when you’re styling outfits for work. It gives a vibe that will make you look professional, smart and stylish. Another way of wearing your black flats is by wearing it with the usual outfits you wear. Swap it with your boots to create a chic look that consists of a leather jacket and skirt. Create a look that will make you look like an expert fashion blogger or stylist by wearing an oversized sweater and skirt that is in the same color. Finish off your look with your favorite pair of black flats. Layering your outfit is a great way of styling your black flats. Here’s another great ensemble you can wear to the office. On the weekends, instead of sneakers or sandals, choose black slip-on flats for that casual yet trendy vibe. A fancy dress requires a pair of fancy shoes. Lace-up flats is just a cute and trendy way to complete any outfit, making it look more stylish than ever. On other casual days, pair your black flats with a skater skirt and printed top for an easy-going, laid-back getup. Complete your look by adding accessories like a necklace and even a fedora hat. If you’re looking for a pair of shoes that you need to invest in, choose black flats. They’ll never let you down. What to Wear with Brown Shoes?